Blog for The Cotton Patch England, with details on the latest patchwork and quilting fabrics, books, notions and wadding that are added to our online store. Stay up to date with our latest products, using blog features and RSS feeds. Kaffe Fassett's Quilt Romance is the latest quilt project book from Rowan. There are 20 quilt projects, photographed against the backdrop of Portmeirion, Clough Williams-Ellis's renowned Italianate village in Wales. The book was launched at the Festival of Quilts, NEC on Thursday and we have signed copies by Kaffe available now. 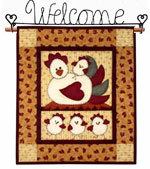 A UK family run patchwork and quilting shop. This blog keeps you up to date with the latest products and additions to our online store.